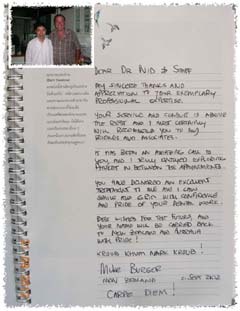 DR.Nid changed my life for several years I was missing teeth due to a broken Jaw. 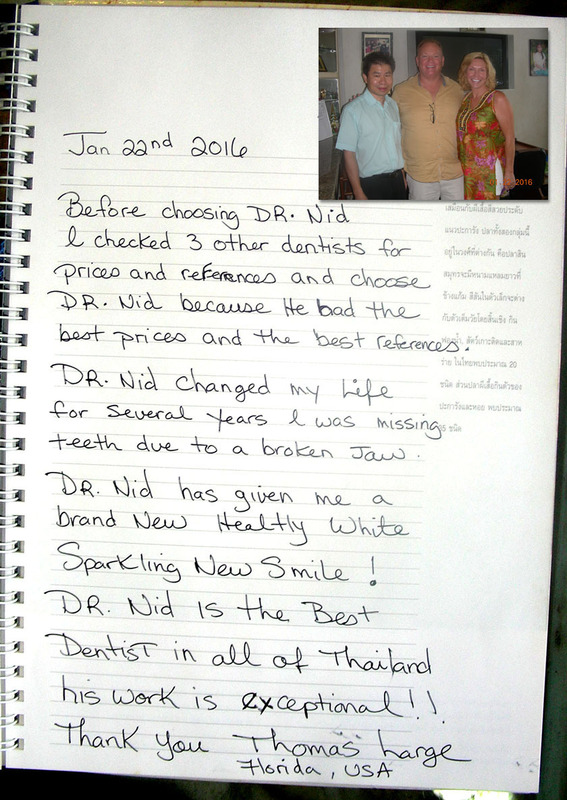 DR.Nid has given me a branc New Healthy White. Sparkling New Smile ! DR.Nid is the Best Dentist in all of Thailand. 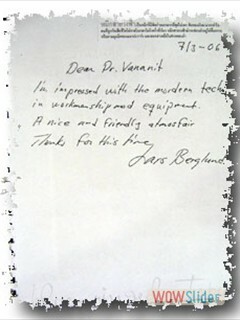 Dr.Veranit is a very caring dentist. He put lots of effort on his job. He details his job with care. Best caring dentist I ever came before. I have my crown, bridge and denture done. I fully recommend anyone for his rofessional job and at a very reasonable price. 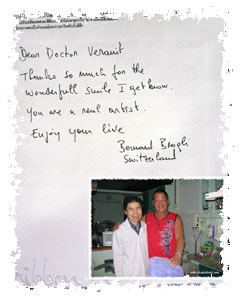 We have never known such friendship as Dr.Veranit has shown us right from the beginning of our contact by email and to the last polishing and friendly smile. His whole clinic is the very best. My husband now has perfect dentures and fillings and I have a bridge at the front top which has mad such a difference to me. Also had all the amalgam removed from my teeth. 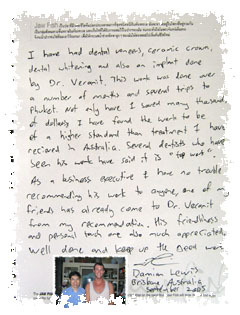 Dr.Veranit's work is extremely proffesional. Undoubtedly the most comfortable dental procedure I have experienced. Yeas of neglect, lam cheps and rugby without a mouthguard had left my teeth in a very unattractive stae. Only 2 viists to the Dr. and the transformation was outstanding. I highly recommend Dr.Veranit and the City Park Dental Clinic. Thank you so much. You are an Excellent Dentist. Recommend you for everybody. Very good job done. Many thanks to your awesome dental work. I have much confidence after your work on my teeth. So I thank you for what you have done!! 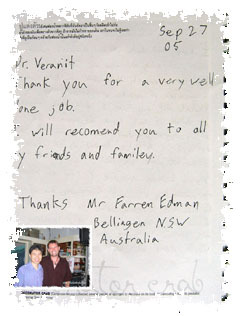 We are both extremely pleased with your wonderful service and quality work. Thank you for looking after us so well. We are all 'smiles'. See you next year for some more. We will highly reccommend you. Thank you for a very well done job. I will reomend you to all my friends and familey. All the way from America to go to dentist. 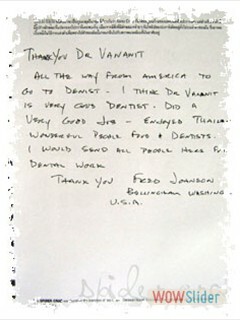 I think Dr.Varanit is very good dentist. 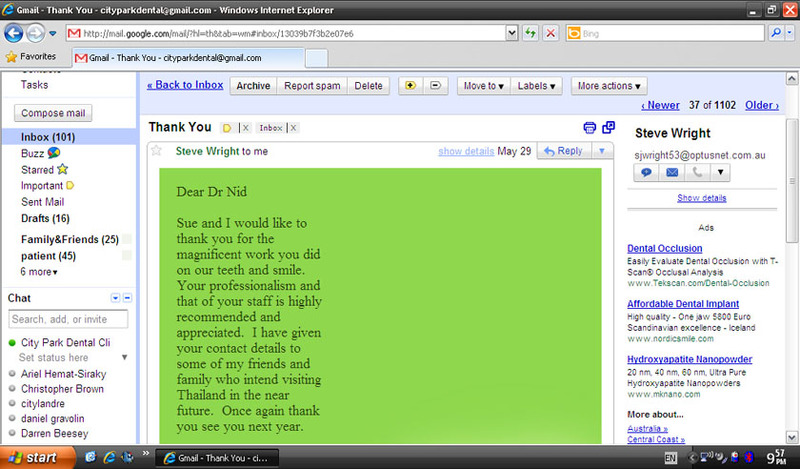 Did a very good jobs - Enjoyed Thailand, Wonderful People Food and Dentists. I would send all people here for dental work. 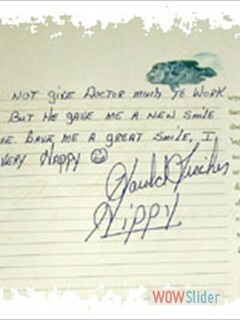 Did not give doctor much to work with,But he gave me a new smile. A love. Gave me a great smile. I am very happy. 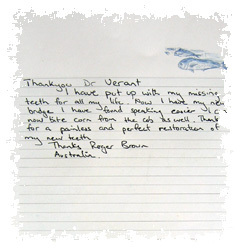 I have thoroughly enjoyed having my teeth rebuilt by doctor Veranit and he is a good .... 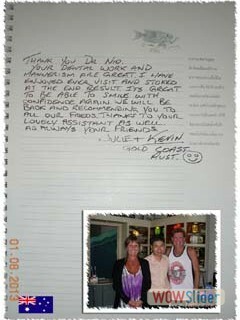 I will recommend to every body in Sunshine Coast. 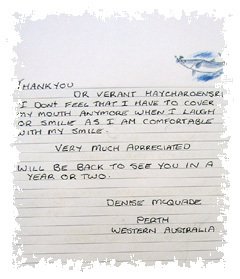 Thank you so very much for looking after me & my teeth. This is now the second time, my family & myself have come to see you. The service we have received has been excellent both by yourself & your friendly staff. 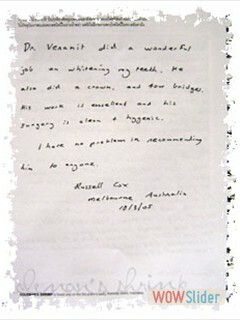 It makes me so happy to have received such good quality dentistry, bridge(my first visit) & crown(my second visit). The tooth whitening has been wonderful & combined with your treatment, I am no longer hesitant to smile & show my teeth. No words can express my sincere gratitude to you for being so wonderful, gentle & kind. We will see you again in the future. I have visited you twice now, what a fantastic job you have done again. Always very gentle, nothing is never too much trouble. We highly recommend you, My crowns look great and I love my white teeth. So reasonbly priced. See you next time I visit Thailand. have being. Hope to see you again in the near future. I am so impressed with the efficiency and professionalism of Dr.Veranit and his staff. I travelled here to Phuket from Tahiti and it was well worth the journey. I am delighted with my new smile ! 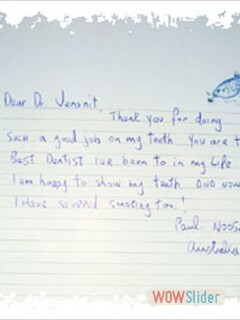 Dear Dr.Veranit, Thank you for giving me the smile I have always wanted. 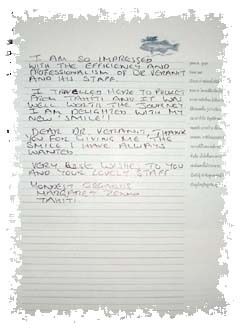 Very best wishes to you and your lovely staff. 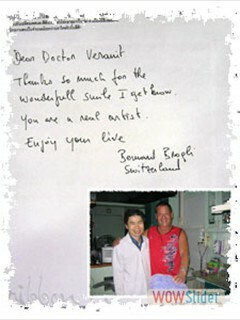 Thank you so much Dr.Veranit, also your staff for your great work since many year. 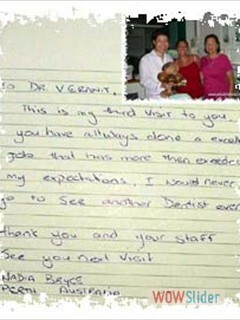 We do enjoy every year the trip at your Dental-Clinic. 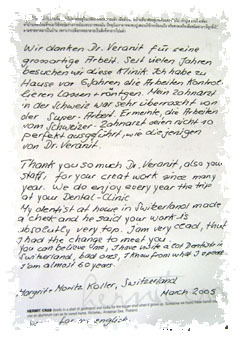 My dentist at home in Switzerland made a check and he said your work is absolutely very top. I am very glad,that I had the chance to meet you. 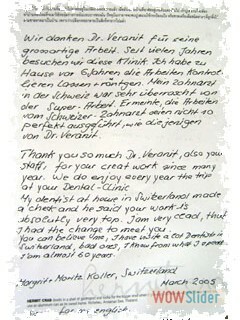 You can believe me, I have visit a lot Dentists in Switzerland, bad ones, I know from what I speak. I am almost 60 years. 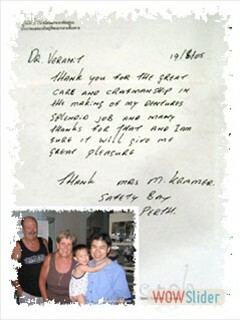 Thank you so much for your wonderful care and expertise. 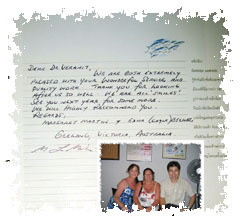 When we visited your clinic, you went out of your way to fit in everything we asked for in such a short time including making and fitting my new dentures. We will return next time we visit Phuket. 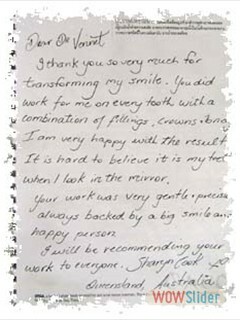 Thank you for the great care and craftmanship in the making of my dentures. Splendid job and many thanks for that and I am sure it will give me great pleasure. Thank you very much for your patience a care of our teeth. 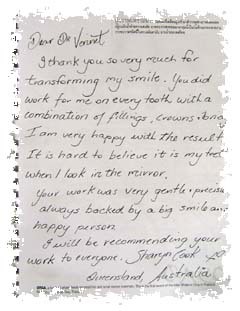 Michael was very impressed with your delicate & detailed work on his teeth & will highly recommend you to family and friends. 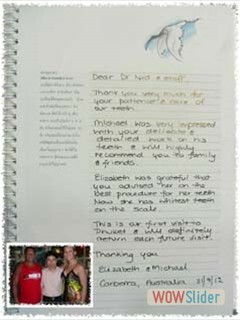 Elizabeth was grateful that you advised her on the best procedure for her teeth. Now she has whitest teeth on the scale. 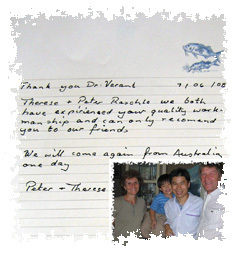 This is our first visit to Phuket and will definitely return each future visit. 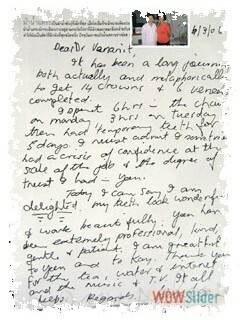 My sincere thanks and appreciation for your exemplary professional expertise. 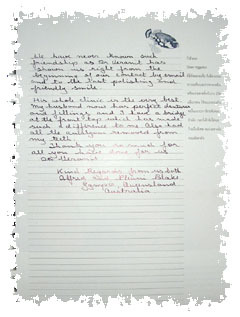 Your service and conduct is above the rest and I must certainly will recommend you to my friends and associates. 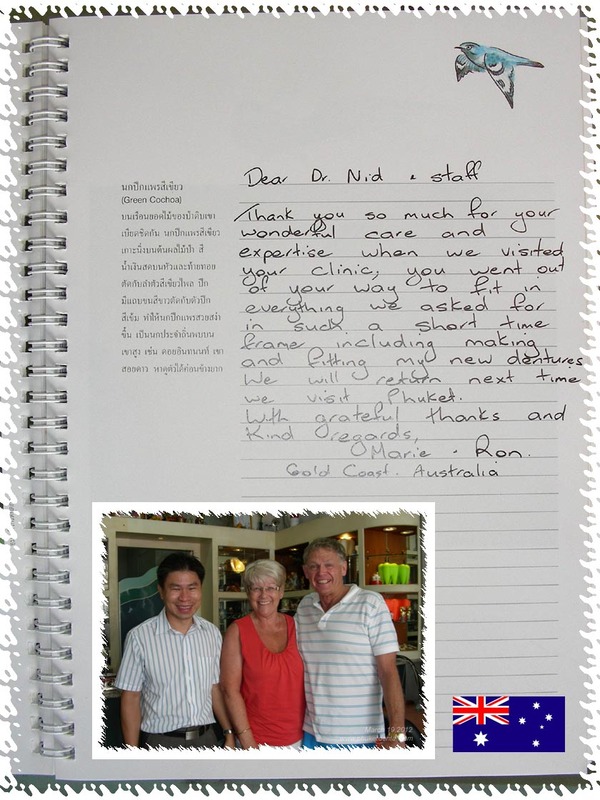 It has been an amazing care to you and i really enjoyed exploring Phuket in between the appointments. You have delivered an excellent treatment to me and I can smile and grind with confidence and pride of your dental work. Best wishes for the future, and your name will be carried back to New Zealand and Australia with Pride! This is my third visit to you. You have always done a excellent job that was more than exceeded my xpectations. I would never go to see another Dentist ever. Thank you and your staff. My visit to the dentist was the best experience I have ever had. 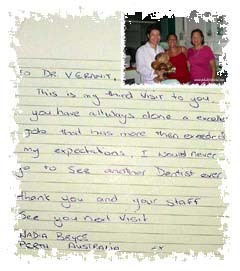 Dr.Veranit Haycharoensri and the staff were professional and pleasant. I am very happy with my new Holliywood smile. Thank you very much for helping me smile again. 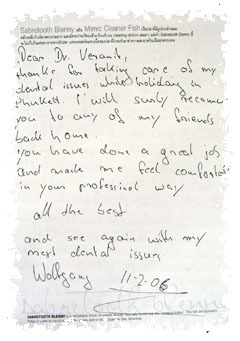 Dr.Veranit has helped me so much. He is friendly, kind and extremely professional. The result of his work is excellent !!! 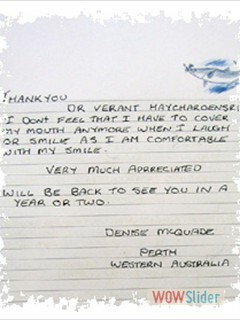 I wouldn't want to visit any other dentist, and will return to hve future dental care treatment performed by him. I recommend him highly !!! I like to give you much thanks for taking very good care of me. I have been so embarrased to go to the dentist for many years and scared. Thank you for giving me a happy big smile back and giving me my confidence back. I will never forget this and I look forward to seeing you again when I come back to Phuket. I have put up with my missing teeth for all my life. Now I have my new bridge I have found speaking easier. I can now bite corn from the job as well. Thank you for a painless and perfect restoration of my new teeth. Thank you for a painless and perfect restoration of my new teeth. Thank you for the great care & attention. I received when I visited you in July. 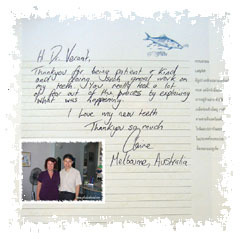 I was very happy with the results and will recommend your clinic to my friends. 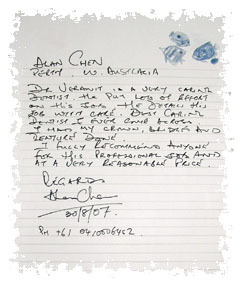 I was down at Phillip Islan at the weekend and remembered you had visited there. Dr.Veranit did a wonderful job on whitening my teeth. He also did a crown, and four bridges. 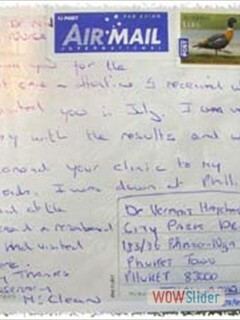 His work is excellent and his surgery is clean and hygenic. I have no problem in recommending him to anyone. Thank you very much!! You have done a very good job on my teeth. Excellent in fact! I was very impressed with your internet site and then communicating with you by email to get everything organised to travel here. Worked very well. 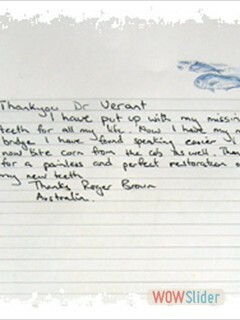 I am extremely happy with the two bridges and crown you arranged and the composite fillings as well. All my teeth are white now and look beautiful. 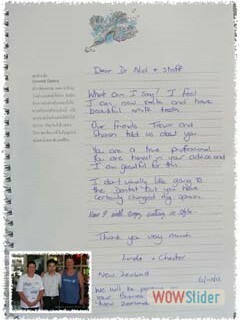 I will reccommend you to peole in New Zealand for your great service, professional attitude, hygenic clinic, and your communication skills. 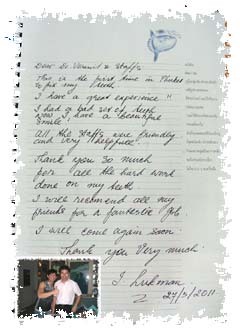 if I need other work done I will not hesitate to return to you here in Phuket. I appreciate your efforts to have all the appointments done to fit in with my short visit which has also become a fabulous holiday. I am greatful and very happy!! PS: I was very impressed with your staff also!!! Thank you so much for the work you have done. 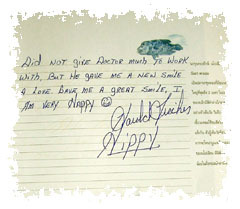 I have been unhappy with other dentists work - but I am very happy with what you have done for me. I was more than happy with the effort you and your staff put in to create my new smile. 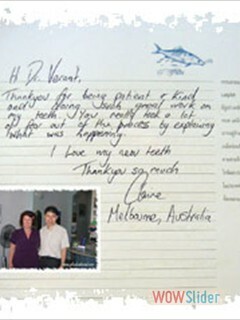 Thank you very much for your great work and gentle management of my very sensitive teeth. Tom's work is also excellent. Keep up the great work. I did not think it was possible for me to have a lovely smile again at 61 years. Your treatment was gentle, honest and so good. 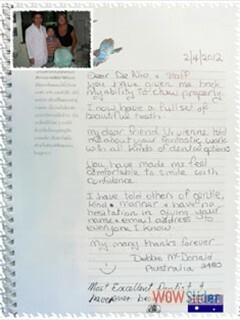 I will not hesite to recommend you to anyone needing Perfet Dental Care. I feel I have made a friend. Thanks so much for the wonderfull smileI get throw. You are a real dentist. Jag ar frau brenge ock yar under I recka operenat intyra titansknevar. I ovre taken Detta yar blivit jaffebra ock daihil utau smarta. Jag kan verkligen rekomendera deu har faud. Lakaren ock priset ar aven def dverkomlikt aeot i svenge. 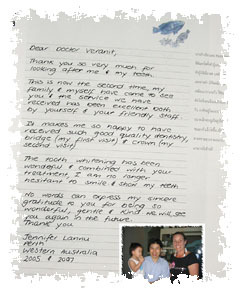 Dr.Veranit you are a miracle worker..
For myself + others. I have never felt so relaxed at a dentist. I looked forward to the visits + your lovely smiles.-one+all. 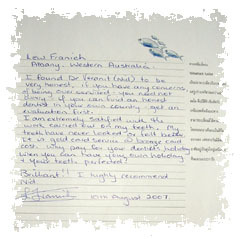 I truely trusted in your gentle expertise and professional gift... I feel reborn happy + can't take the smile of my face. There is a quiet confidence birthed in me that with faith all things are possible. Thank you from the bottom of my heart and thanks to all yur staff for their caring support. I will recommend your services to all I meet. That's a lot so people to be busy !! What can I say? I feel I can now smile and have beautiful white teeth. Our friends Trevor and Sharon told us about you. You are a true professional. You are honest in your advice and I am greatful for this. I don't usually like going to the Dentist but you have certainly changed my opinion. Now I will enjoy eating in style. We will be passing on your business card to other New Zealanders. Thank you for being patient + kind and doing such great work on my teeth. You really took a lot of fear out of the process by explaining what was happening. I Love my new teeth. Great work the difference between when I walked in an when the work was completed is amazing. I would highly recommend anyone requiring dental work to contact me. 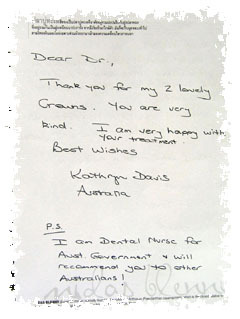 I will give you a reference at any time and will recommend you to all my friend who require dental treatment. 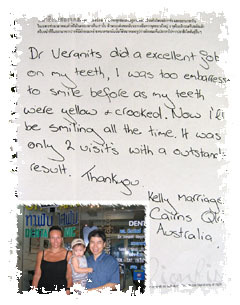 I have had dental veneers, ceramic crown, dental whitening and also and implant done by Dr.Veranit. 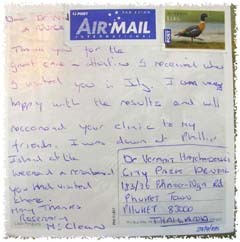 This work was done over a number of months and several trips to Phuket. 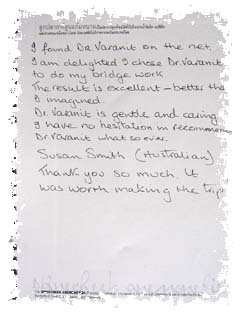 Not only have I saved many thousands of dollars, I have found the work to be of a higher standard than treatment I have recieved in Australia. 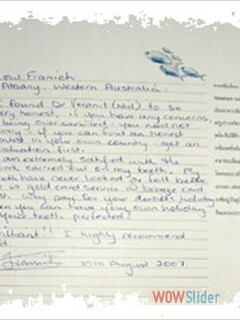 Several dentists who have seen his work have said it is "top work". 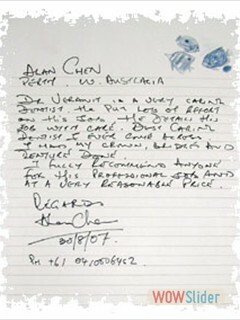 As a business executive I ahve no trouble recommending his work to anyone, one of my friends has already come to Dr.Veranit from my recommendation. His friendlisness and personal touch are also much appreciated. 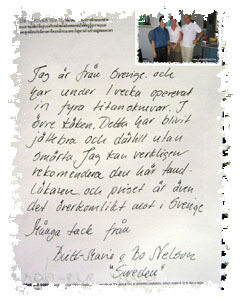 Well done and keep up the good work!!! You have given me back my ability to chew properly. I now have a full set of beautiful teeth. My dear friend Vivienne told me about your fantastic work with all kinds of dental options. You have made me feel comfortable to smile with confidence. I have told others of gentle, kind manner and have no hesitation in giving your name and email address to everyone I know. Most excellence dentist I have ever been to. This has been truly an amazing "painfree" experience. I now have a beautiful smile, such white teeth !. I can chew again too. I can't wait a big steak. Your service is best and very professional. I will be recommending your services to all my friends and family. I wish you all the best for now and the future. I don't feel that I have to cover my mouth anymore when I laugh or smile as I am comfortable with my smile. Will be back to see you in a year or two. 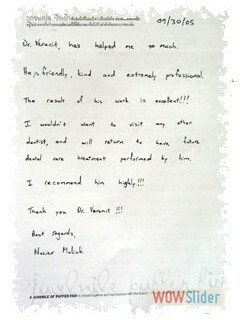 Dr.Veranit did on excellent job for myself and my wife Annette. 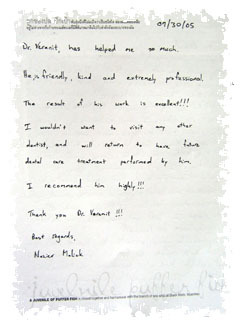 He showed very good skill and the treatment was excellent. I will pass on to my friends. 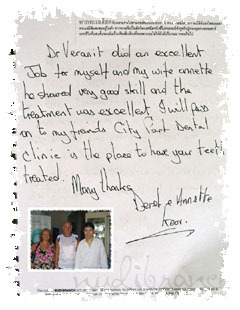 City Park Dental Clinic is the place to have your teeth treated. 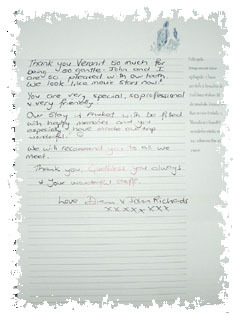 Thank you Veranit so much for being so gentle. John and I are so pleased with our teeth. We look like movie stars now !! You are very special, so professional and very friendly. 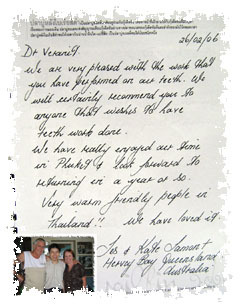 Our stay in Phuket with be filled with happy memories and you especially have made our trip wonderful. 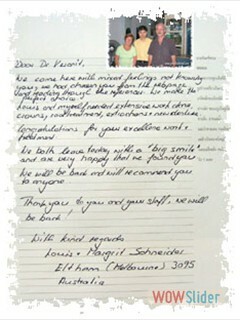 We will recommend you to all we meet. Thank you, God bless you always and your wonderful staff. It has been a long journey both actually and metaphorically to get 14 crowns and 6 veneers completed. I spent 6 hrs in the chair on Monday, 3 hrs on Tuesday and then had temporary teeth for 5 days. I must admit. I sometimes had a crisis of confidence at the sake of the job and the degree of trust I had - you. Today I can say I am delighted. My teeth look wonderful and work beautifully. 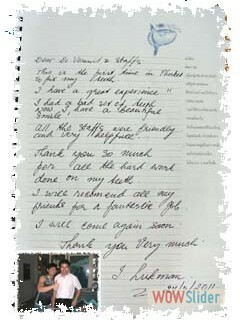 You have been extremely professional, kind, gently and patient. I am greatful to you and Kay. Thank you for the tea, water and internet and musicand TV. Thank you for my 2 lovely crowns. You are very kind. I am very happy with your treatment. Dr.Veranits did a excellent job on my teeth, I was too embarressed to smile before as my teeth were yellow and crooked. Now I'll be smiling all the time. it was only 2 visits with a outstanding result. We came to Phuket for teeth work as you were recommended by friends. They were right you and your staff are very professional , friendly and did a fantastic job on both of us. I am extremely happy. I now have teeth where I haven't had for 30 years. I had a lot of work done. My teeth were very bad. 10 hours in the dentist chair well worth while I can now happily smile and chew on a big steak. Everyone here is fantastic. Thanks so much. 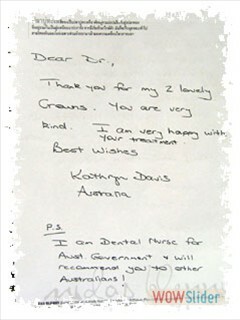 Great work and crowns. I am so pleased excellence job thank. We will both highly recommend to friends etc. 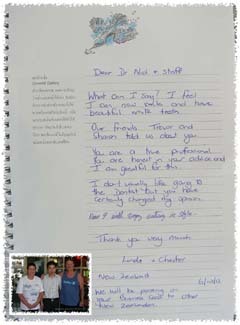 We got a holiday and our teeth fixed for less than the price of getting them fixed in Australia and more professional. I'm impressed with the modern tech in workmanship and equipment. A nice and friendly atmosfair. 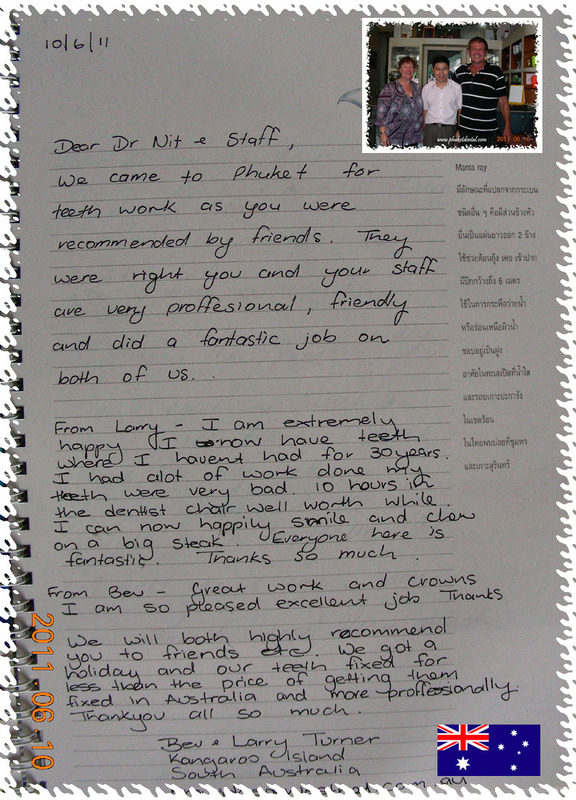 We are very pleased with the work that you have performed on our teeth. 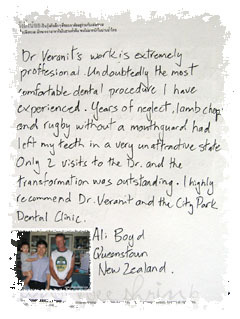 We will certainly recommend you to anyone that wishes to have teeth work done. We hve really enjoyed our stayiing in Phuket and look forward to returning in a year or so. Very warm friendly people in Thailand!! 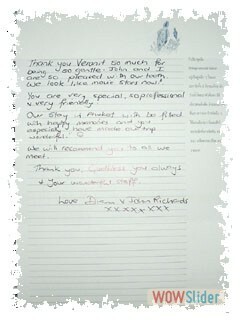 We hve loved it. 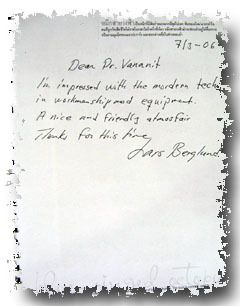 I found Dr.Veranit(Nid) to be very honest, if you have any concerns, of being over serviced, you need not worry. If you can find an honest dentist in your own country, get an evaluation first. I am extremely satified with the work carried out on my teeth. My teeth have never looked or felt better. It is gold card service and bronze card cost. Why pay for your dentists holiday when you can have your own holiday and your teeth perfected ? Brilliant !! I highly recommend Nid. Do you realise that this is a dream come true ? The idea of coming back to Thailand started after my first visit 3 years ago. I needed to have more dental work done and I decided to plan a family vacation and locate a dentist that I could have confidence in on the internet. 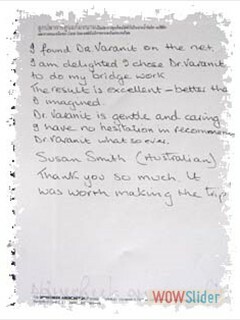 I selected Dr.Veranit's practice because he had himself designed a fantastic web site,totally informative and very professional. 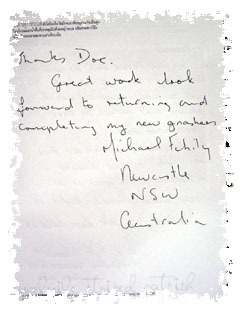 He corresponded the past two years, increasing my confidence in him. 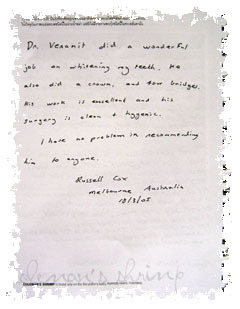 I am ecstatic with the work done and would highly recommend Dr.Veranit to all. We come here with mixed feelings not knowing you. We had chosen you from the webpage and reading through the references. We make the perfect choice. 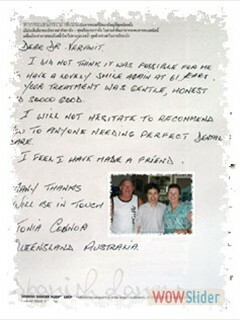 Louis and myself needed extensive work done, crowns, root treatment, extractions and new denture. Congratulation for your excellent work + treatment. We both leave today with a "big smile" and are very happy that we found you. 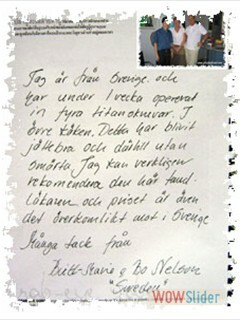 We will be back and will be recommend you to anyone. Thank you to you and your staff, we will be back ! What a wonderful gift you have of make dental procedures. Painless, quick, efficient + very professional. I am so happy. I can smile + I will be smiling a lot more now ! I will return + highly recommend you. This is the first time in Phuket to fix my teeth. I have a great experience !! I had a bad set of teeth. Now I have a beautiful smile ! 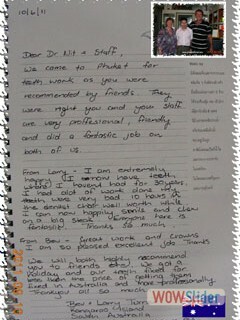 All the staffs were friendly and very helpful. Thank you so much for all the hard work done on my teeth. I will recomend all my friends for a fantastic job. I will come again soon. I am over the moon with my new teeth. My teeth have never looked better. I would not have thought it possible. 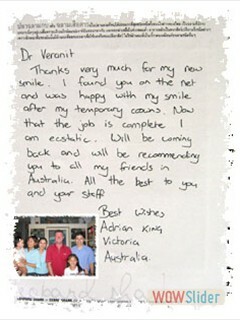 Dr.Veranit is very professional and friendly. I will recommend him to everybody who needs a great dentist. Thank you for such gentle professional treatment. We will be the centre of attention at Burleigh Bowls Club. Will reccomend to all our friends. I have treated from Dentist to Dentist to find someone to deal with my sensitive teeth. I have never had the privilege before to have someone with such expertice and knowledge work on my teeth and explain what is happening. The warmth that has been shown to me is like no other and I highly recomend. 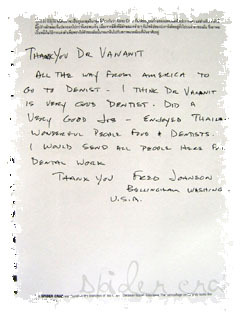 I would fly 2 times around the world to have my teeth worked on by Dr.Veranit I can only express my gratitude by these words and even then my words do not do this gentleman justice! This will be a visit to truly remember! Thank you for doing such a good job on my teeth. 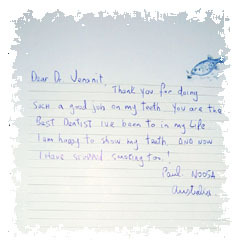 You are the Best Dentist I've been to in my life. I am happy to show my teeth. And now I have stopped smoking too ! 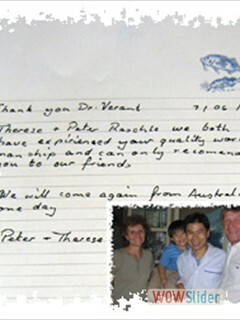 Therese & Peter Raschle we both have expirienced your quality workmanship and can only recomend you to our friends. 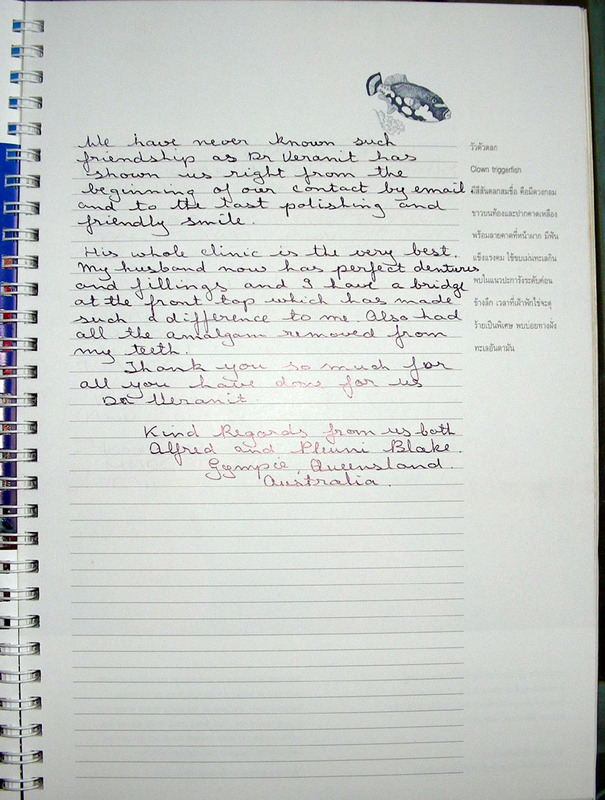 We will come again from Australia one day. I thank you so very much for transforming my smile. You did work for me on every tooth with a combination of fillings, crowns, bridge. I am very happy with the result. It is hard to believe it is my teeth when I look in the mirror. Your work was very gentle, precision. Always backed by a big smile and happy person. I will be recommending your work to everyone. 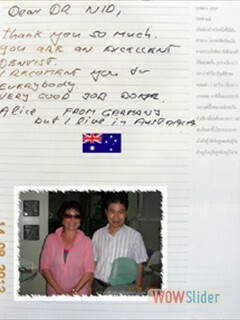 Sue and I would like to thank you for the magnificent work you did on our teeth and smile. 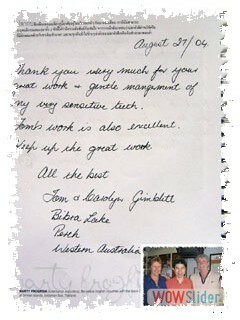 Your professionalism and that of your staff is highly recommended and appreciated. 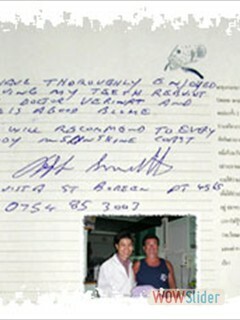 I have given your contact details to some of my friends and family who intend visiting Thailand in the near future. Once again thank you see you next year. I found Dr.Varanit on the net. I am delighted. 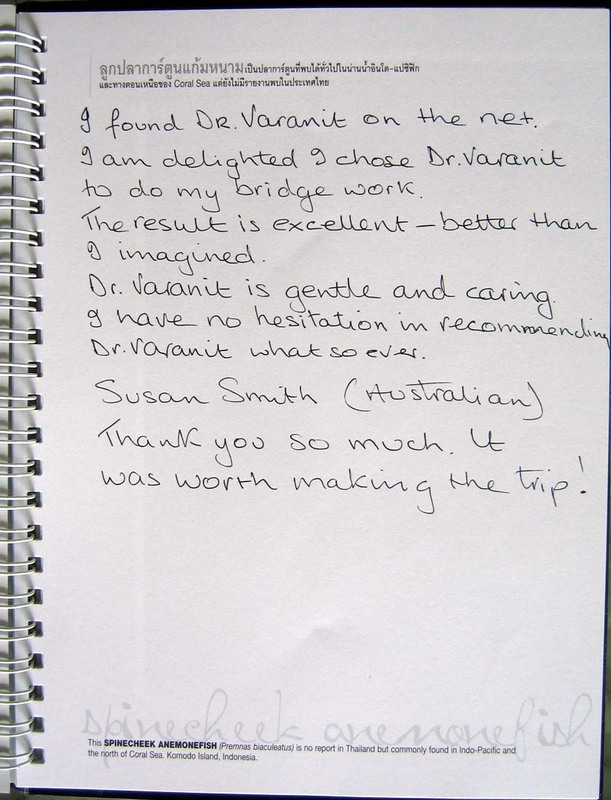 I chose Dr.Varanit to do my bridge work. The result is excellent - better than I imagined. 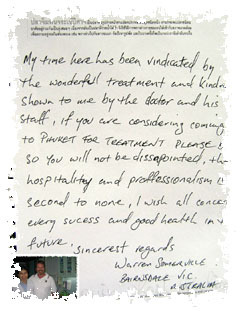 Dr.Varanit is gentle and caring. 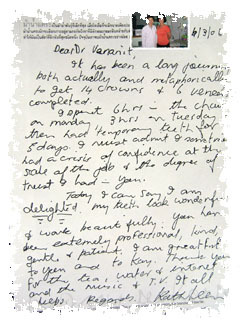 I have no hesitation in recommending Dr.Varanit what so ever. Thank you so much. It was worth making the trip! My time here has been indicated by the wonderful treatment and kindness. Shown to use by the doctor and his staff. 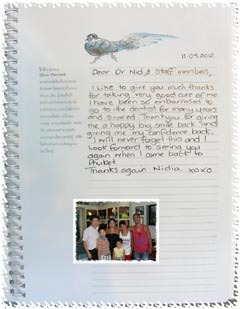 if you are considering coming to Phuket for treatment., please do. 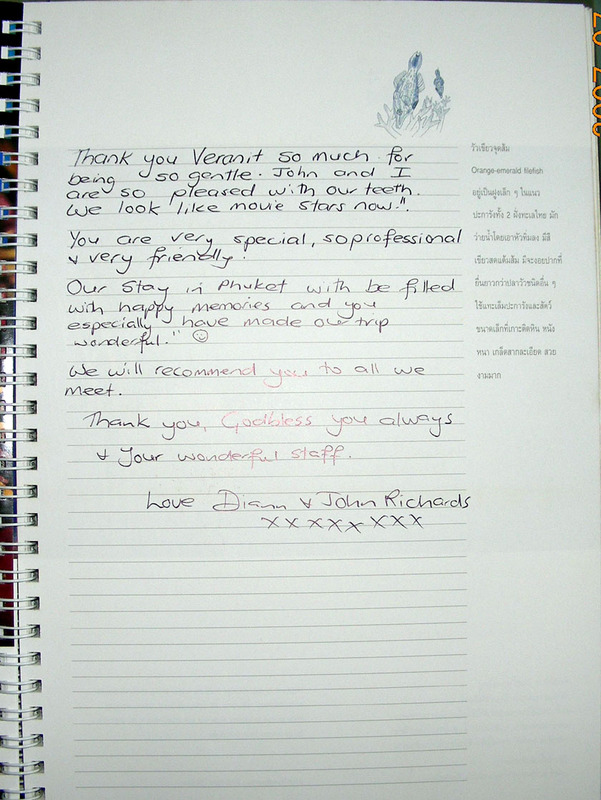 So you will not be disappointed, the hospitality and professionalism is second to none. I wish all concerned every sucess and good health in the future. 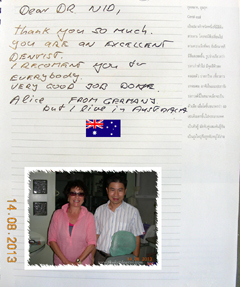 Thanks for taking care of my dental issues while holiday in Phuket. I will surely recomend you to any of my friends back home. 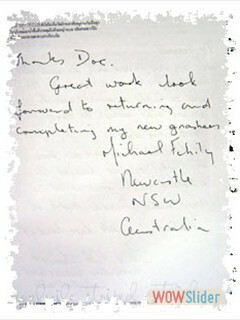 You have done a great jobs and make me feel comfortable in your professional way. All the best and see again with my dental issues.